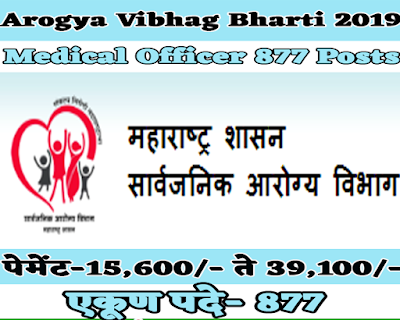 Sarvajanik Arogy Vibhag Maharashtra has published an official notification for recruitment of 877 Medical Officers Posts. Interested and Eligible candidates who wants to apply for these posts send their applications by post on below given address before 19th January 2019. For more details like age limit, salary, how to apply, selection process please refer the below article. Rs. 15,600/- to 39,100/- + Gred Pay Rs. 5,400/- payable as a salary. Written and oral examination can be organized as per the requirement for selection on this employment post. Candidates with outstanding performance will be selectedApplicants who have successfully undergone First Aid Course.